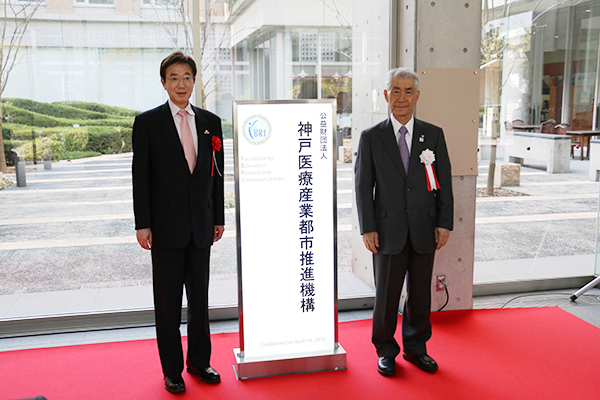 the Foundation for Biomedical Research and Innovation at Kobe. 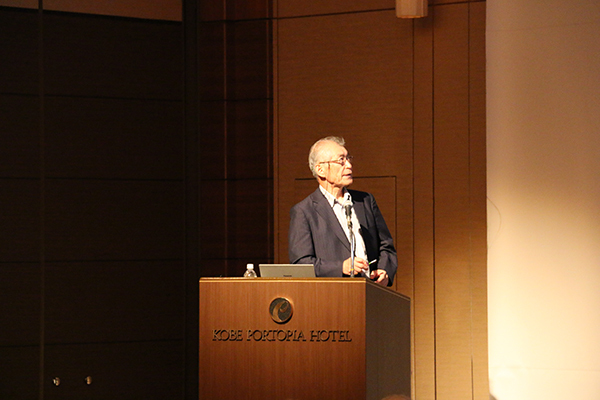 Prof. Honjo has taken the molecular biological approach and contributed significantly to the development of immunology. He won this prize for his discovery of PD-1, one of the molecules he had studied. The immune-suppressing effect of PD-1 has been reported and the creation of an antibody against PD-1 has proved to serve well in cancer treatment. As a result of the development of gene mutation, cancer is supposed to be attacked by the immune system. According to recent findings, however, cancer deliberately evades the immune system’s attack by using PD-1 or cytotoxic T-lymphocyte-associated antigen 4 (CTLA-4) discovered by Prof. Allison of the U.S., who shared the Nobel Prize with Prof. Honjo. Therefore, if the effects of these substances are blocked by the antibody, the cancer comes under the immune system’s attack and can be treated successfully. Cancer ranks highest among the causes of death in Japan. I am especially pleased to send my sincere congratulations to Prof. Honjo who has developed the new treatment method for cancer and produced such excellent achievements. I am very pleased to receive the good news that Tasuku Honjo, President of the Foundation for Biomedical Research and Innovation at Kobe, won the 2018 Nobel Prize in physiology or medicine. Prof. Honjo, who was then the dean of the medical school of Kyoto University, was engaged in the establishment and operation of the Kobe Biomedical Innovation Cluster promoted by Kobe City. Since the establishment of the Foundation in 2000, as a board member, Prof. Honjo had given instruction and advice to the researchers for some time. 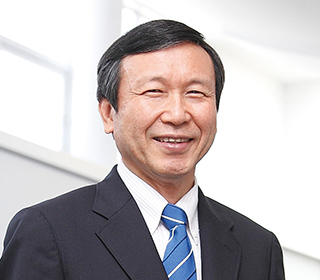 Since July 2015, as President of the Foundation, Prof. Honjo has taken leadership in management of the Foundation and promotion of the Kobe Biomedical Innovation Cluster. 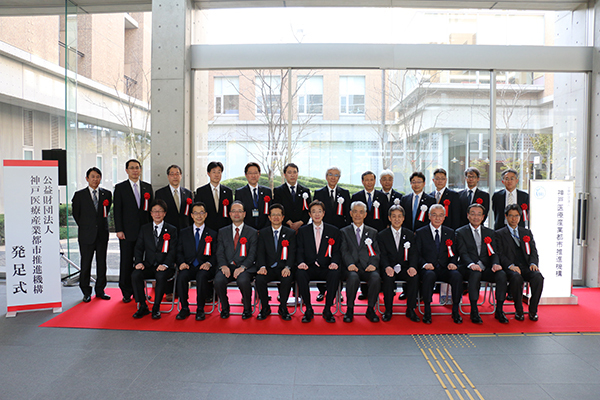 In April 2018, under Prof. Honjo’s leadership, the Foundation restructured its organization to promote sustainable growth of the Kobe Biomedical Innovation Cluster and accelerate innovation inside the cluster, and changed its name from the Foundation for Biomedical Research and Innovation to the Foundation for Biomedical Research and Innovation at Kobe. In this manner, in both name and reality, the new organization is devoting itself to promotion of the biomedical cluster. Prof. Honjo has become the “face” of the Kobe Biomedical Innovation Cluster. The news that Prof. Honjo, the face of the cluster, won the Nobel Prize serves as a strong tail wind for the cluster. I am very pleased to have the opportunity to promote the cluster more strongly to the world and achieve a greater leap forward in the future. 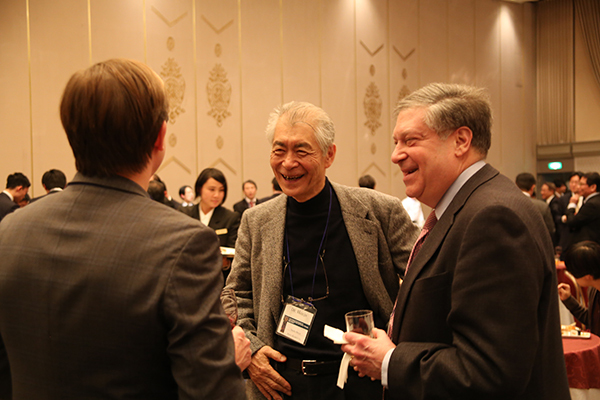 Prof. Honjo has been active not only as President of the Foundation but also as a researcher. In Kobe, he launched the research project in collaboration with Meiji Seika Pharma Co., Ltd. in April 2016. 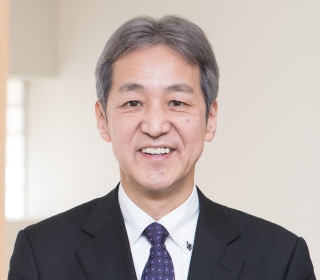 He plays the role of director of the program titled “drug discovery research into autoimmune diseases and cancers.” Furthermore, he launched the research project in collaboration with Sysmex Corporation and Kyoto University in April 2018. As the director of this program, he has been involved in the “developing technologies for diagnosing immunological diseases” (conducted as a part of the drug discovery innovation program). 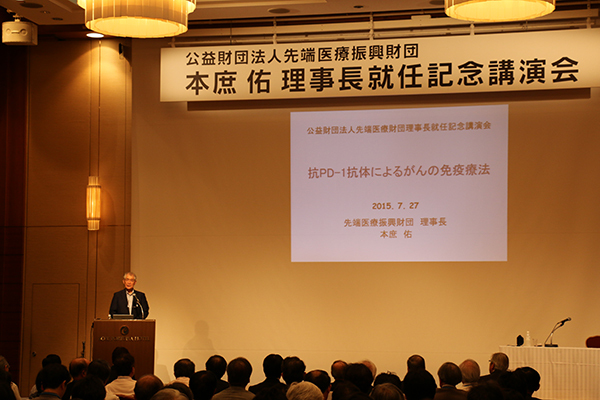 Prof. Honjo’s winning of the Nobel Prize is expected to further boost his research activities in Kobe. 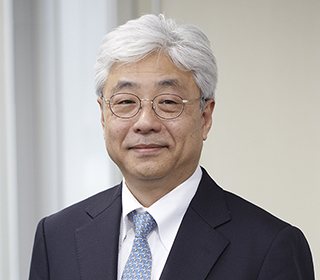 Prof. Honjo, who values the policies and basic principles, manages the Foundation for Biomedical Research and Innovation at Kobe meticulously and appropriately. He has become even busier than before since he received the Nobel Prize. We will provide full support for him to alleviate his stress, if only a little. As members of the honorable foundation having a Nobel laureate as President, we will work together on our mission for the sake of further development of the Kobe Biomedical Innovation Cluster. I would like to take this opportunity to express my sincere congratulations to Dr. Tasuku Honjo for receiving the 2018 Nobel Prize in Physiology or Medicine. The awardment of the Nobel Prize to Dr. Honjo has been long awaited. I feel great job that his achievements in paving the way for developing new cancer immunotherapy have finally been recognized. This is the result of his achievements over many years in basic research demonstrating the importance of sincere dedication to research. Also, I truly respect the foresight and leadership Dr. Honjo displays through his initiative in life science research. His winning the Nobel Prize is not only a source of pride to the Kobe Biomedical Innovation Cluster, but will also surely energize the entire Japanese society. I hope that he will continue to play an active role in leading the world together with the younger generation. The year 2018 marks the 20th anniversary of the Foundation for Biomedical Research and Innovation at Kobe (FBRI) and the 15th anniversary of the Translational Research Center for Medical Innovation (TRI). It is a tremendous honor for the FBRI and Kobe City that Dr. Honjo, the FBRI President, was awarded the Nobel Prize in Physiology or Medicine in this significant year. The discovery and invention made by Dr. Honjo have not only brought revolutionary transformation in cancer medicine and therapy but also have urged a paradigm shift in medical and biological research. In appreciation of living in the same era as Dr. Honjo, we must commit ourselves to promoting strategic research and development in a steady manner based on solid basic science. We are living in the age of an unprecedented revolution in science, technology and society. As Dr. Honjo repeatedly emphasized, people’s health is one of the most important assets of a country and humans. The conquest of disease is the goal of the FBRI and TRI. The results of our constant efforts in research over the last 15 years show that it is possible to achieve this goal. Our strong support and commitment have enabled the practical application of regenerative medicine, which was merely a dream at the time of the establishment of the Foundation. Thanks to Dr. Honjo’s discovery and invention, we have reached about 60% of the goal of conquering cancer, one of the most difficult challenges for us to overcome. We have already adopted a totally new approach to conquering cancer to achieve 100% success. While providing benefits for residents of Kobe City, we will also focus our efforts on promoting healthcare innovation so that we can share the results from our research with other people around the world. Sharing the pleasure of Dr. Honjo’s winning the Nobel Prize with all the people and reminding ourselves of the ideals and hopes that we had when the Foundation was established, we will further commit ourselves to achieving a society where people can enjoy a long, healthy, active, happy life. I would like to express my sincere congratulations to Dr. Tasuku Honjo for receiving the 2018 Nobel Prize in Physiology or Medicine. Dr. Honjo’s outstanding research over many years has resulted in the development of the anti-PD-1 antibody “Opdivo,” which has brought about hopes to people suffering from cancer. His efforts in this research and development will open up the path to new drug development using the patient’s own immune functions. In his research, Dr. Honjo has demonstrated the great importance of basic research in order to develop technology that significantly contributes to our society. 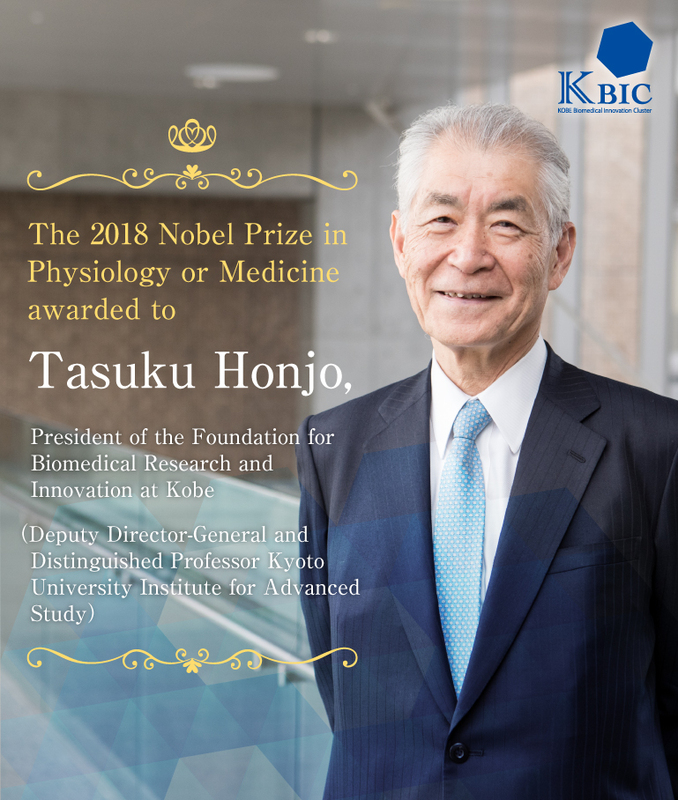 Dr. Honjo’s winning the Nobel Prize has served as a great encouragement to the staff of the Foundation for Biomedical Research and Innovation at Kobe who are engaged in healthcare research and development in the Kobe Biomedical Innovation Cluster. I hope that Dr. Honjo will play the leading and active role in introducing further biomedical research and new healthcare technology development from Kobe. 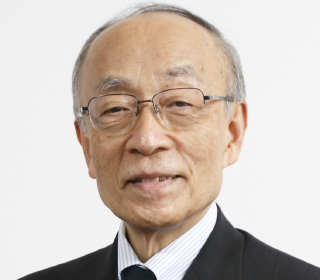 On behalf of the Center for Cluster Development and Coordination (CCD), I would like to express our congratulations to Dr. Honjo on being awarded the Nobel Prize in Physiology or Medicine. Dr. Honjo has been deeply involved in promoting the Kobe Biomedical Innovation Cluster project since its launch. His winning the prize therefore gives us particular encouragement. As a member of the Foundation for Biomedical Research and Innovation at Kobe (FBRI), the CCD is very proud of his great achievement. In April this year, the CCD underwent an organizational reform with the aim of promoting cooperation and integration among companies, research institutes, universities and healthcare facilities clustered in the Kobe Biomedical Innovation Cluster. Under the reformed organization, the CCD has been developing an integrated support system for practical application and commercialization of development seeds of companies and researchers in the cluster. 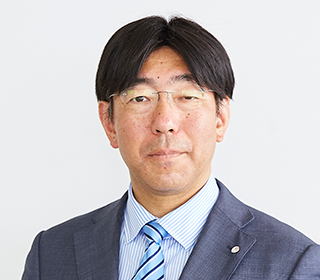 Under the Drug Discovery Innovation Program initiated by the CCD, Dr. Honjo has been involved in two joint research projects in the immunological field. The motivation for the 2018 Nobel Prize being awarded to Dr. Honjo was based on his research in this immunological field. The aim of any of his research efforts is to develop innovations through cooperation among companies, research institutes and universities. It is expected that his research will be further accelerated toward innovative drug discovery. The Kobe Biomedical Innovation Cluster has entered a new stage 20 years after the initiation of the concept behind it. The CCD is determined to support the Cluster in developing into a truly globally recognized life science cluster under the leadership of Dr. Honjo. 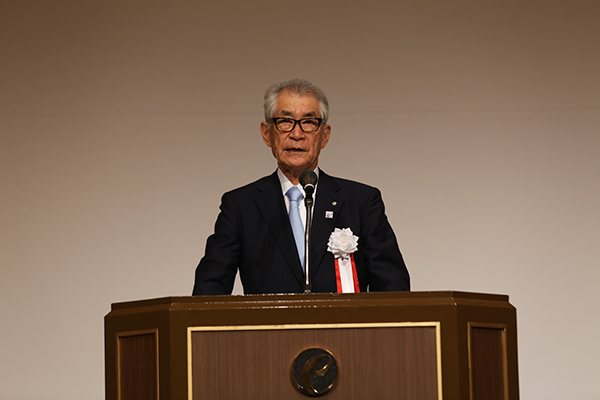 Dr. Tasuku Honjo assumed the Presidency. 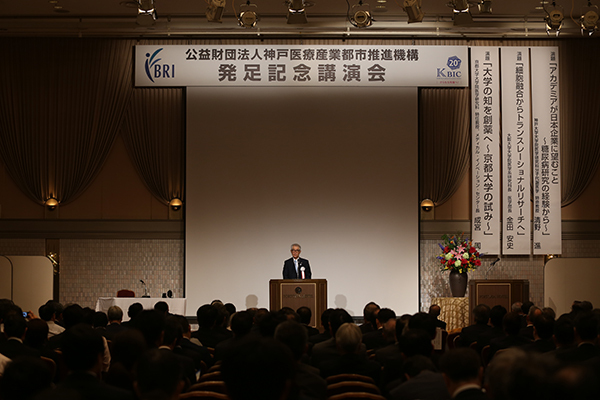 President Honjo was a member of the round-table conference on the Kobe Biomedical Innovation Cluster Concept held in 1998 to discuss how the KBIC should be set up. He served as a board member upon the establishment of the Foundation for Biomedical Research and Innovation. He has been involved in efforts to promote the KBIC, including the development of the Kobe Life Science Promotion Vision in 2007. Lecture and reception commemorating his inauguration as President of the Foundation for Biomedical Research and Innovation were held. Joint drug discovery research into autoimmune diseases and cancers was started. 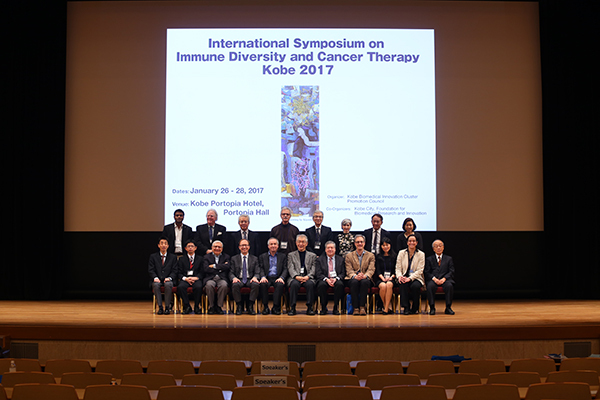 International Symposium on Immune Diversity and Cancer Therapy Kobe 2017 and a public open seminar were held. 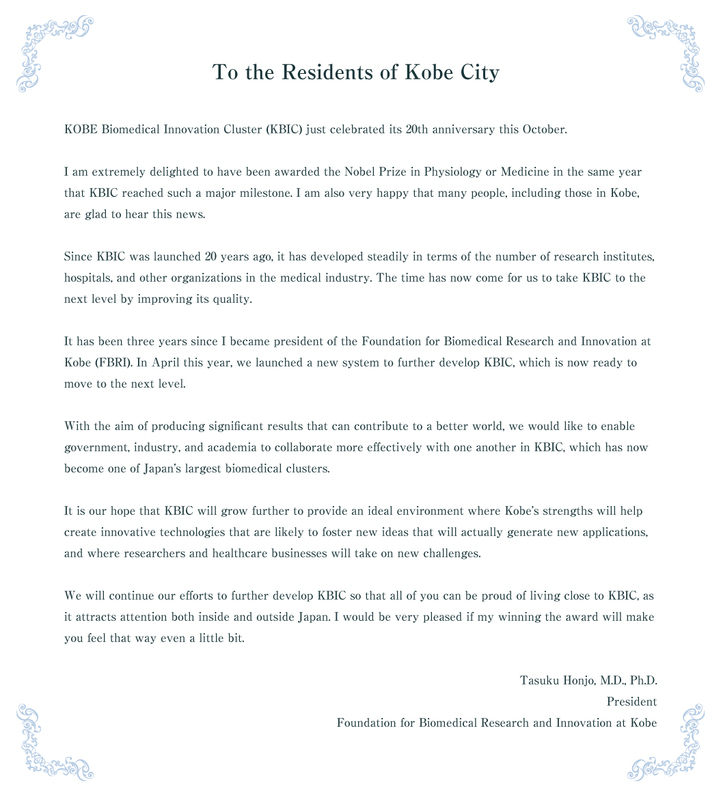 The Foundation for Biomedical Research and Innovation was progressively reorganized to form the Foundation for Biomedical Research and Innovation at Kobe, whose mission is to promote research and development in the KBIC and enhance cooperation and integration in the cluster. Joint research on the development of technologies for diagnosing immunological diseases was started. 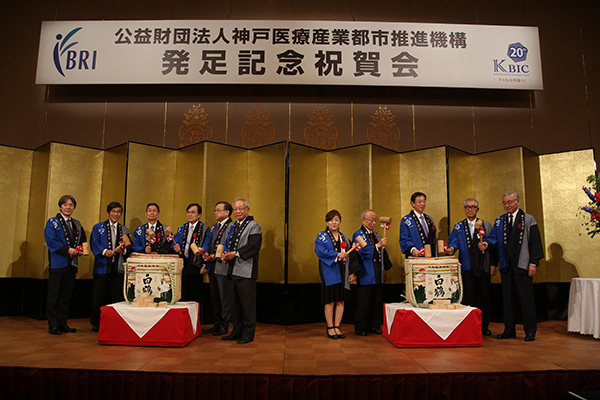 An inaugural lecture on the occasion of the establishment of the Foundation for Biomedical Research and Innovation at Kobe and a party celebrating the inauguration were held. “Nobel Prize Award Ceremony” was held at Stockholm Concert Hall on Dec 10. President Tasuku Honjo delivered his speech at the Nobel Banquet took place in the Blue Hall of the Stockholm City Hall. 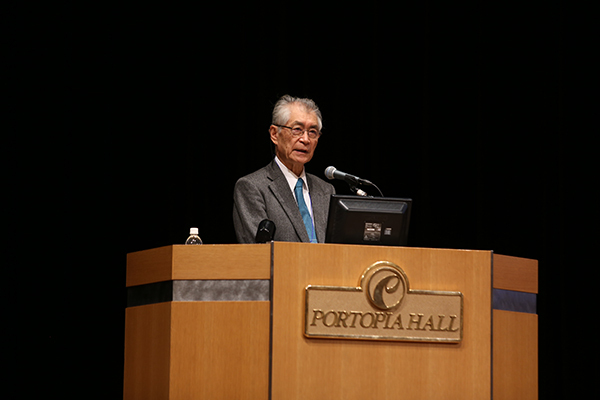 President Tasuku Honjo delivered the lecture “Serendipities of acquired immunity” at the Nobel Lectures in Physiology or Medicine 2018. The Nobel Prize Award Ceremony will be held at 16:30, Dec 10 at Stockholm Concert Hall in Sweden. 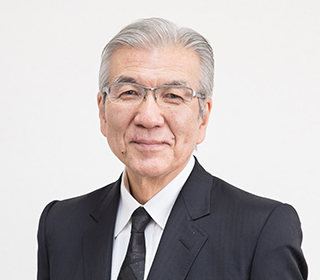 Before the ceremony, President Tasuku Honjo will deliver his lecture at “Nobel Lectures in Physiology or Medicine 2018” held at 14:00, Dec 7. 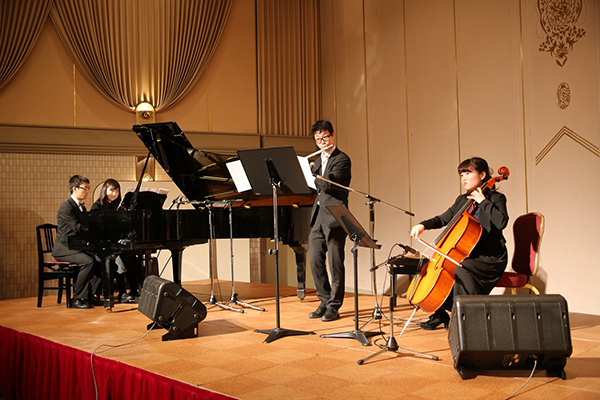 Kobe Biomedical Innovation Cluster 20th Anniversary Commemorative Ceremony was held on Oct 19. In response to the announcement that President Tasuku Honjo won the 2018 Nobel Prize in physiology or medicine on October 1, 2018, a press conference was held. 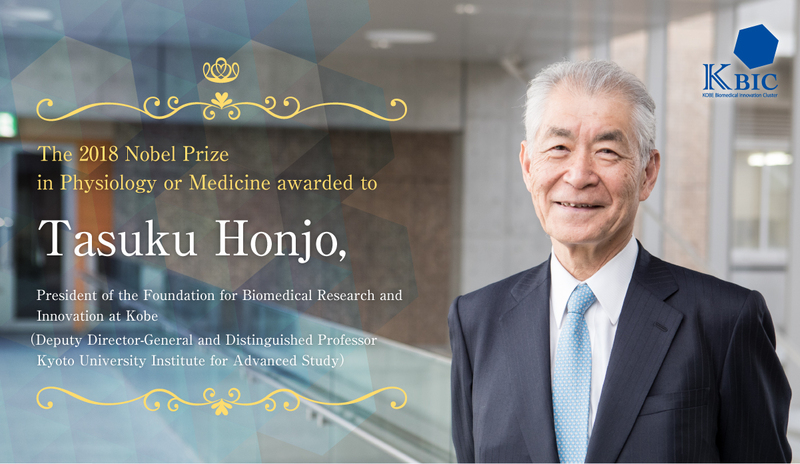 President Tasuku Honjo was announced as a laureate of the 2018 Nobel Prize in Physiology or Medicine. Copyright 2018 Foundation for Biomedical Research and Innovation at Kobe.